The Hug-Gram by Send-A-Hug!™, available exclusively from The Serious Teddy Bear Company, is a wonderful way to show you care for someone - regardless of the reason or occasion. When you can't be there to hug them in person, this is a fantastic alternative. 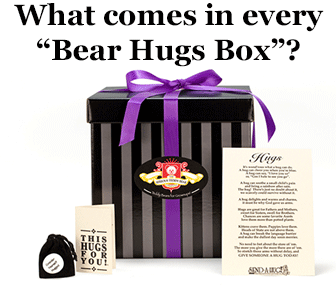 What comes standard with every Hugs Box? 1) "Hugs", the teddy bear for grown-ups, is the softest, plushest, most upscale teddy bear you'll ever wrap your arms around. Comes in your choice of colors. Meet "Hugs" the Bear. 3) A little black velvet pouch which holds a keepsake stone that says it all: ''Consider yourself Hugged!" 4) A copy of our beloved Hugs poem, printed on heavy card stock paper. See the poem here. 5) A bed of multi-colored confetti. 6) All of the above is contained within our very own exceptionally upscale and beautiful custom-designed black and gray stripe gift box. The gift box is elegant, high quality, and reusable. 7) Last but not least, a high-quality satin gift bow is tastefully wrapped around all sides to finish your Hugs Box with a touch of class. Add more to your "Hug-Gram" Box! But it doesn't stop there! You can add lots of other items to your "Hug-Gram" Box that will make it even more special - and personalized for whatever the reason or occasion. Check out our great selection of add-ons. We have a wonderful assortment of heartfelt books, sweets, and accessories that can be securely nestled among all the other terrific standard components of your "Hug-Gram" Box!